Video filmed by a drone-mounted camera shows the extent of the damage caused by Saturday's devastating earthquake which struck Nepal’s capital, Kathmandu, and the surrounding area. A 7.9-magnitude earthquake struck near Kathmandu on Saturday, at approximately 12:00pm local time. The confirmed death toll stand at over 4,200 and continues to rise as search and rescue missions progress. The quake, followed by a series of aftershocks, leveled homes and other buildings, destroying roads and communications infrastructure, further hindering rescue operations, while triggering several avalanches. 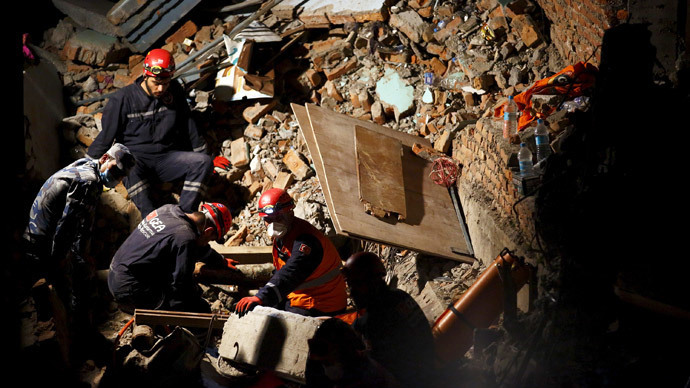 Saturday’s quake became Nepal's worst in 81 years. Back in 1934, an 8.2-magnitude temblor in the area nearly destroyed the entire city of Kathmandu, as well as several nearby towns, causing more than 12,000 deaths. The cost of the damage inflicted by the latest earthquake is estimated at up to $10 billion, which amounts to about half of Nepal's entire GDP. Several countries have already pledged millions of dollars of humanitarian aid and sent rescue teams and equipment to assist in the relief effort.